This is an essential view of life in up-coutry Thailand. I have taken a smartphone snap of my hand holding an exceptional taste treat...an ice-cream sandwich! A fresh bread bun, with texture more like sponge cake than bread...the bun has been cut to create a valley...deep in the valley lies a scoop of sweet sticky rice...on top of the rice are five scoops of freshly made coconut ice-cream...over the ice-cream has been drizzled a spoon of nuts and a squirt of chocolate syrup. In the lane, at the front of our house-yard, Na is purchasing several more ice-cream sandwiches for the sweet tooths in our extended family. 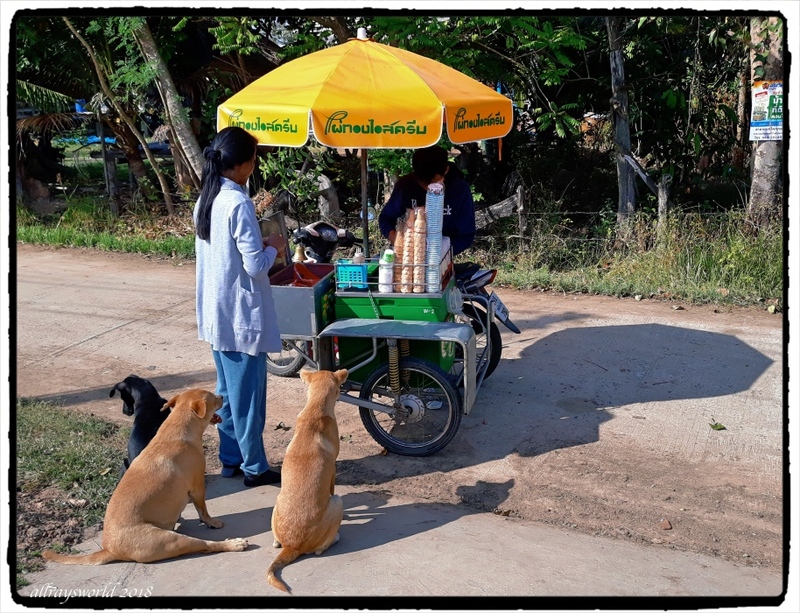 In the second image, you can see Na has the company of three of our dogs ...all patiently waiting for the extra ice-cream sandwich Na has purchased, and will share among them...our dogs know a snack opportunity exists when they hear the ice-cream vendor approaching. Ray: The treat is delicious, and the experience is enjoyable, Astrid. Cela a l'air bien appétissant. Ray: C'est un délice, Martine ... la glace de coco est mon préféré. I scream, you scream, we all scream for ice cream! And if it's coconut, even more so for me. So, Ray, how often does he come around????? Ray: We see this vendor perhaps twice a week, Ginnie, but don't buy his wares often. Ray: I really enjoy this treat, Lisl, and the experience of buying from the travelling vendor. Ray: These dogs are not stupid, Chris. La photo est vraiment très attractive ..Vos chiens sont comme le mien , l'odeur de la glace le fait arriver bien vite près de nous ..
Ray: Nos chiens sont toujours à l'affût d'une délicieuse friandise, Claudine, et sont bien élevés car ils savent que cela améliore leurs chances d'obtenir une récompense. That looks fantastic Ray. The bread looks like brioche which I expect goes down a treat with ice cream. Ray: I am not familiar with brioche, Chad...this bread is soft and a bit sweet, almost like a sponge cake. It looks absolutely delicious and even though I have just had a great breakfast I have room for one of those. The second shot is so cute. Dogs will be dogs. Na looks like she is dressed for the cold. It didn't go down to 30 did it? Ray: It is delicious, Mary.. The dogs are not stupid! Ray: A nice treat, Bill, but perhaps not quite as tasty as a bacon sandwich. That looks absolutely delicious, and the dogs certainly know they are in for a treat. Ray: Yes...this is a tasty treat Brian...and the dogs certainly know it. Ray: Not too shabby, eh!